p53 is an upstanding example of a tumor suppressor gene, right? Perhaps not, says a recent paper demonstrating a tumor-promoting pathway stimulated by the protein. p53, a protein widely associated with tumor suppression, has been shown to play a tumor-promoting role in some types of cancer by a team of researchers from the University of California San Diego (CA, USA) led by Yang Xu. These findings are directly contrary to one of the prevailing opinions in cancer biology that p53 is the “guardian of the genome” and, in its wild type state, is one of the most effective tumor suppressor genes. p53 is found in a mutated state in over 50% of all cancers but in specific types of cancer, such as liver cancers, it is most often found intact in its wild type state. In order to explore the effect of the intact p53 on cancers, Xu et al studied the wild type of the protein in hepatocellular carcinoma (HCC) cells, in a project that lasted four years and included research from mouse models, cell samples and human patients. The results of the study found that in HCC cells, p53 interacts with the gene PUMA, acting as a transcription factor for the promotion of its expression. 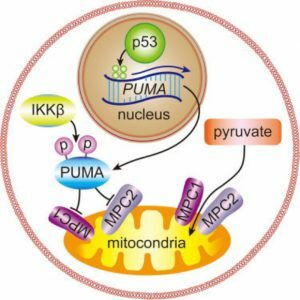 The resultant PUMA protein inhibits the uptake of pyruvate into the mitochondria which forces the organelle to stop conducting respiration by oxidative phosphorylation and instead switches to using glycolysis to produce energy, a key step in promoting an enhanced metabolism for cancer cells. “This role of WTp53 can resolve several long-lasting paradoxes in p53 biology and will be instrumental in the development of cancer therapy." The distinction between p53 in a tumor suppressor role and in a tumor promotor role is due to the stage of a cell in its’ development to a cancer cell. At the beginning of a cell’s mutation, p53’s antioxidative phosphorylation action prevents the formation of further genome toxins, therefore acting as a tumor suppressor. However, when a tumor has been established, the stimulation of a switch to glycolysis perpetuates the growth of the tumor. “It’s actually the same function but playing exactly the opposite role in two different contexts,” explains Xu. These results indicate that a cohort of current cancer therapies aimed at increasing the function of p53 to stimulate cancer cell death may be inadvertently promoting the growth of already established tumors.